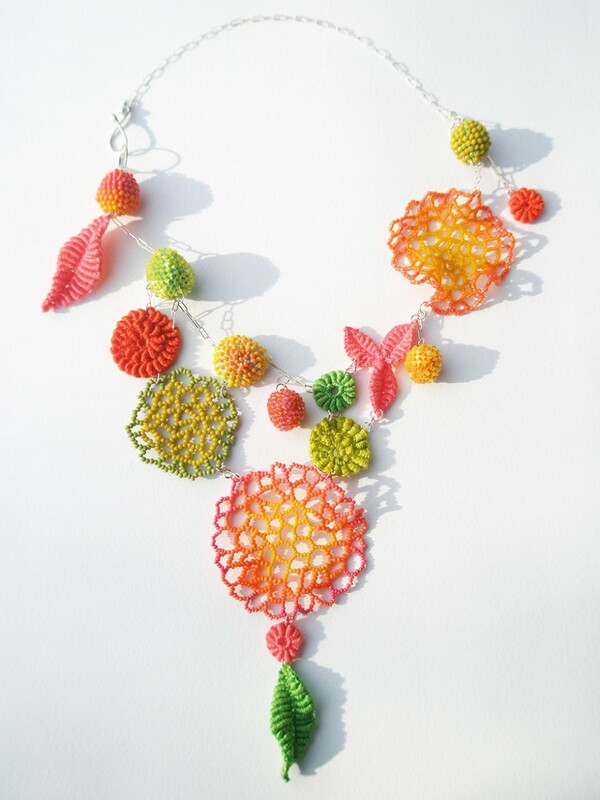 Summer Bouquet, Necklace. 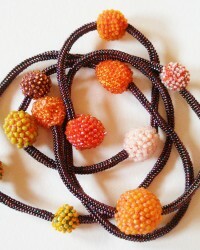 Glass seed beads, linen, cotton, sterling silver. 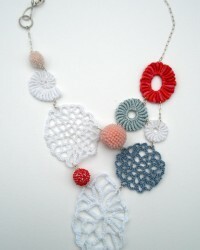 Red Sky in Morn, Necklace. 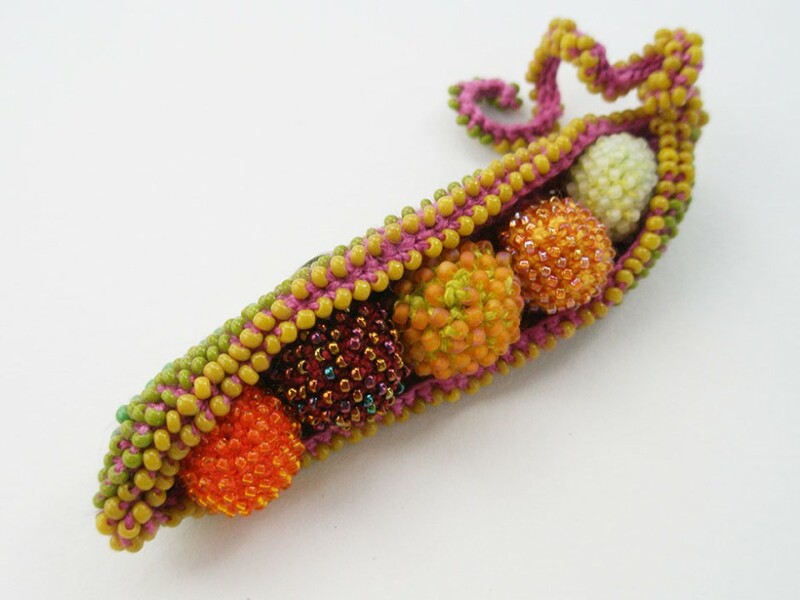 Glass seed beads, cotton, linen, sterling silver. Sorbet Necklace. 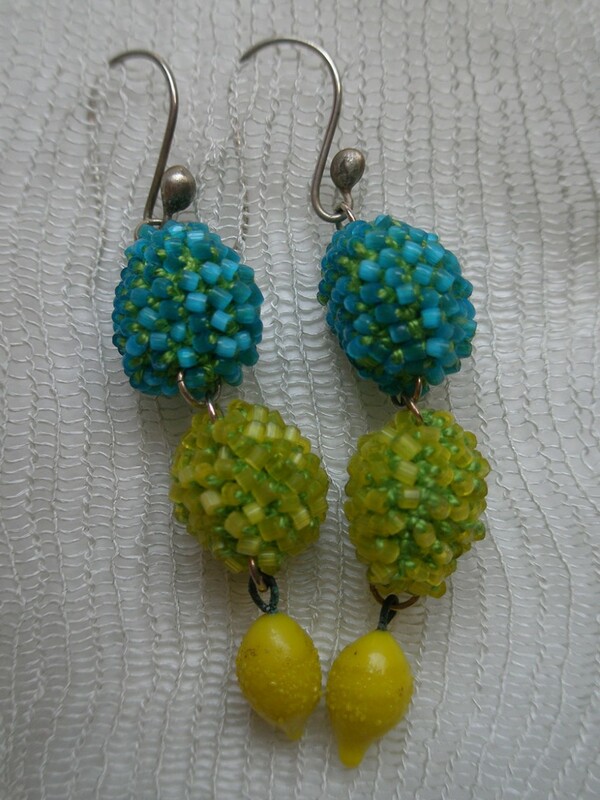 Glass seed beads, linen, cotton, sterling silver. 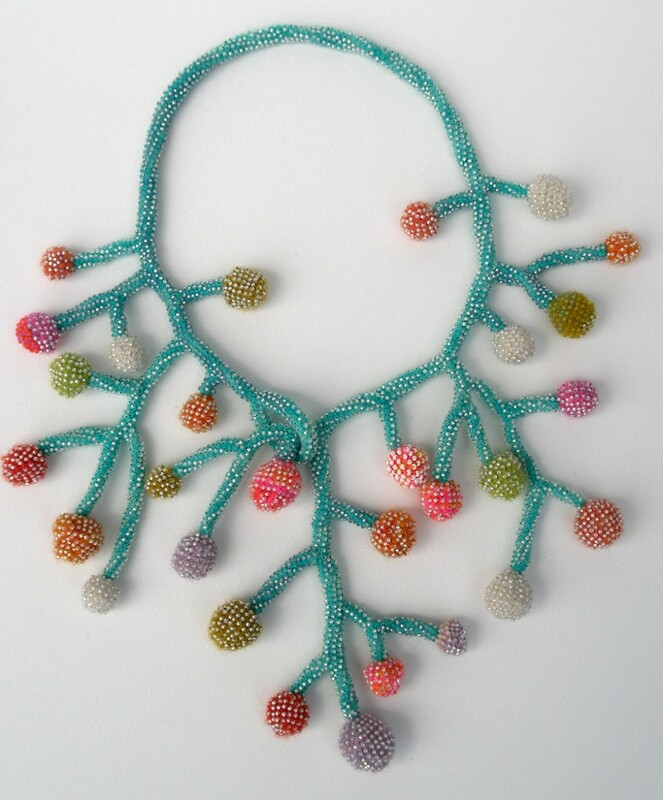 Swim with Me, Necklace. 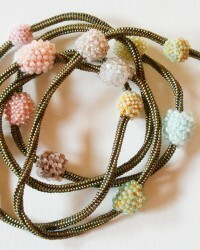 Glass seed beads, merino wool, linen, cotton, sterling silver. 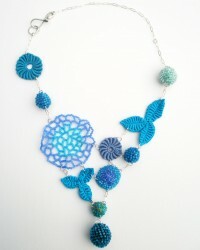 Dusk, Necklace. 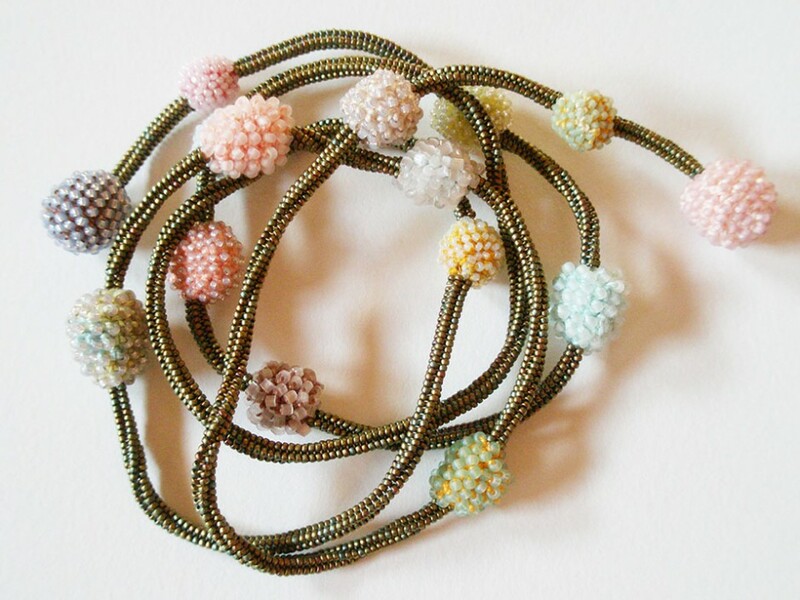 Glass seed beads, cotton, linen, nylon thread, sterling silver. 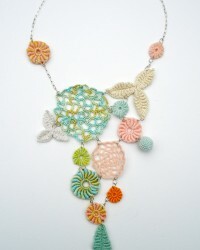 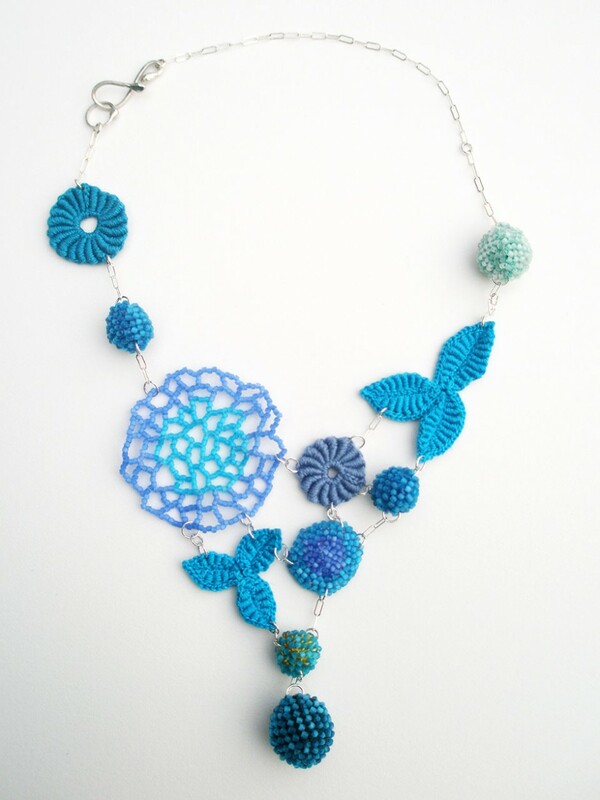 Spring in Your Step Necklace. 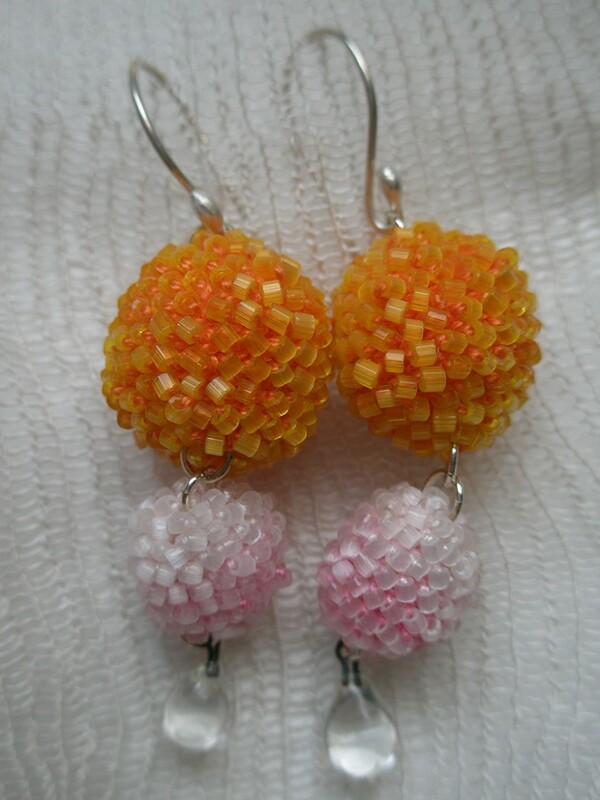 Glass seed beads, cotton, linen, sterling silver. 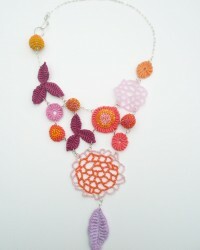 Raspberry and Orange Zest Necklace. 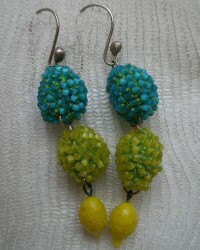 Glass seed beads, cotton, linen, sterling silver. 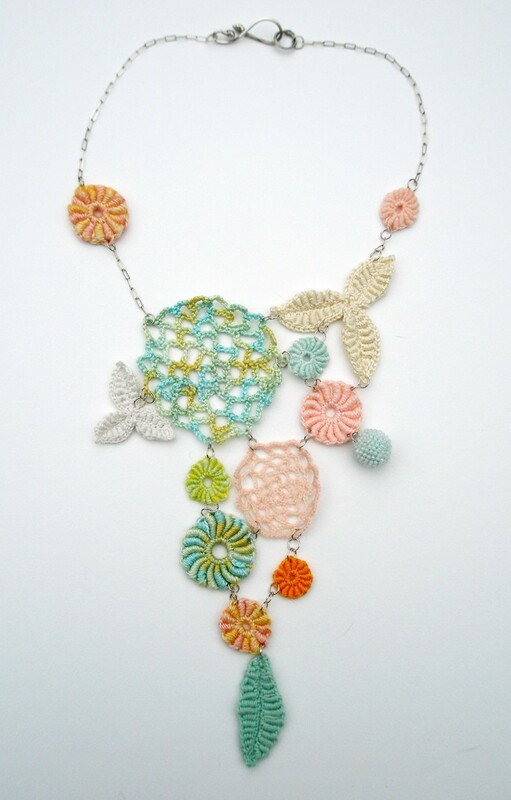 Bronze and Pastel Necklace. 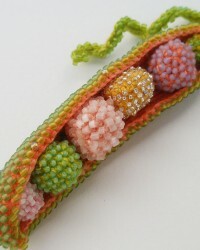 Glass seed beads, linen, cotton, nylon thread, crocheted and beaded. 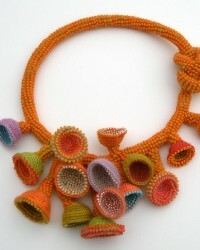 Embers, Necklace. 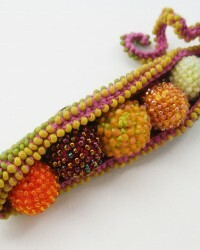 Glass seed beads, cotton, linen, nylon thread, crocheted and beaded. 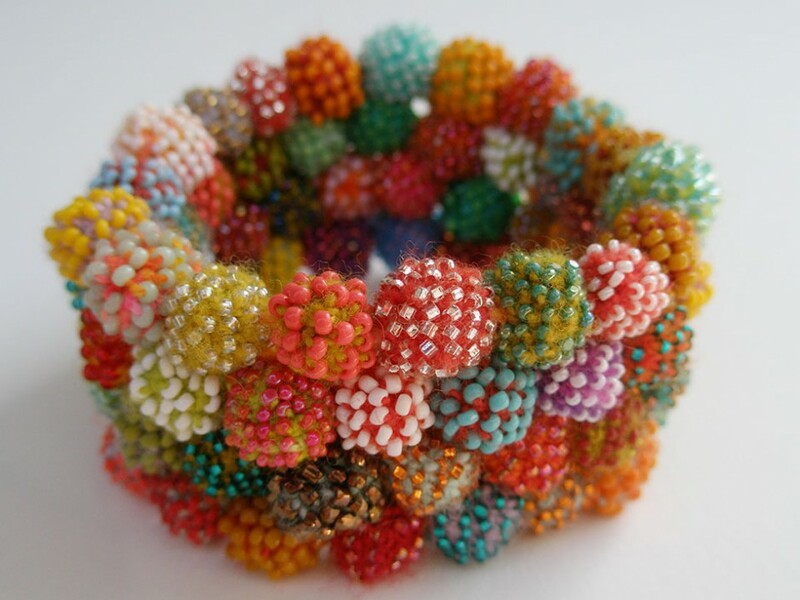 Molecule Bracelet. 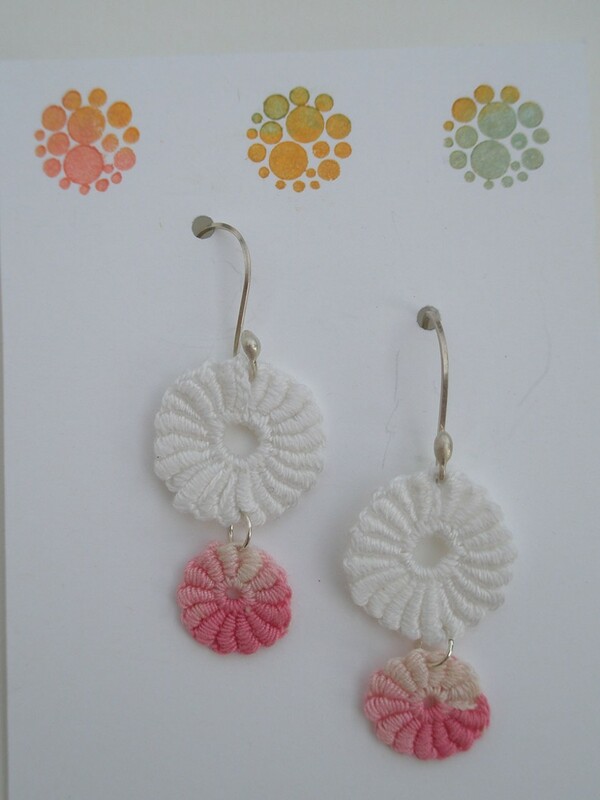 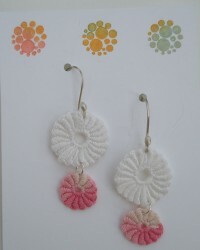 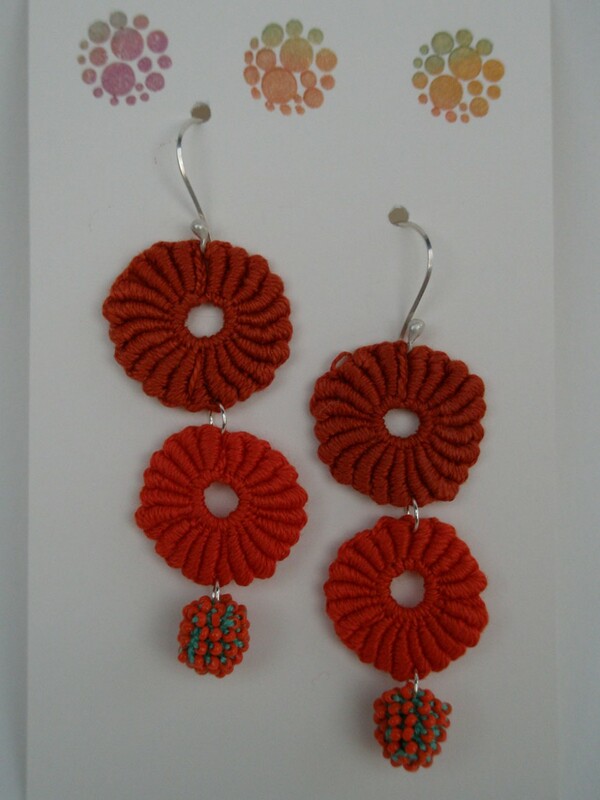 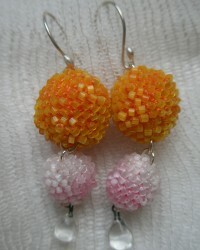 Glass seed beads, merino wool, crocheted, magnets. 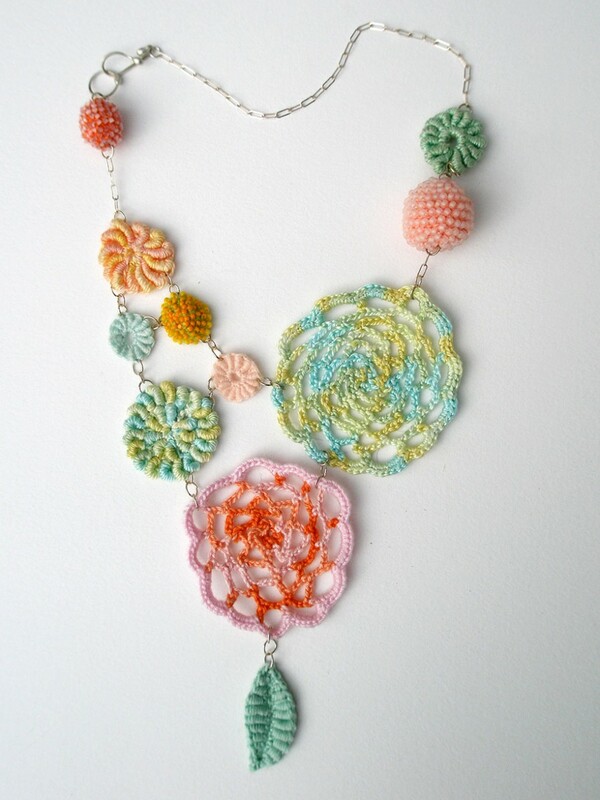 Spun Sugar, Necklace. 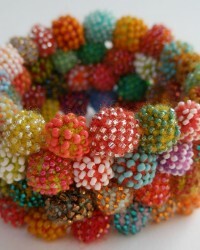 Glass seed beads, merino wool, crocheted, and fulled. 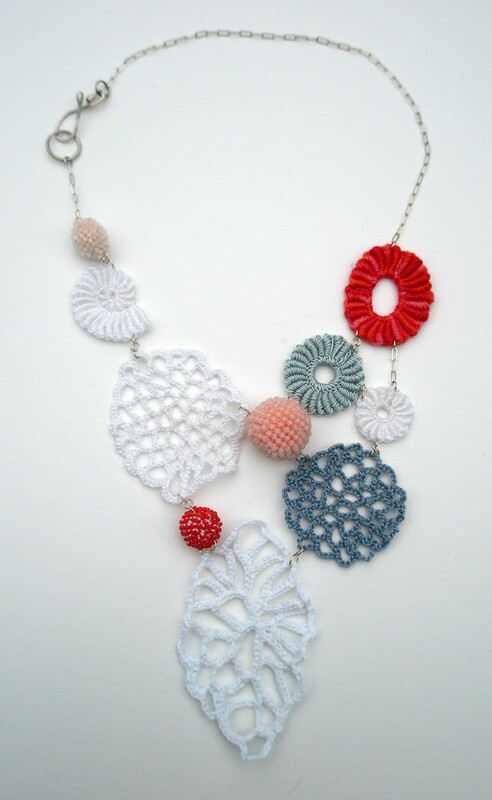 Lichen Necklace. 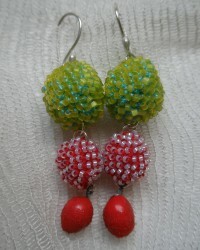 Glass seed beads, merino wool, crocheted. Liquid Sunset , Necklace. 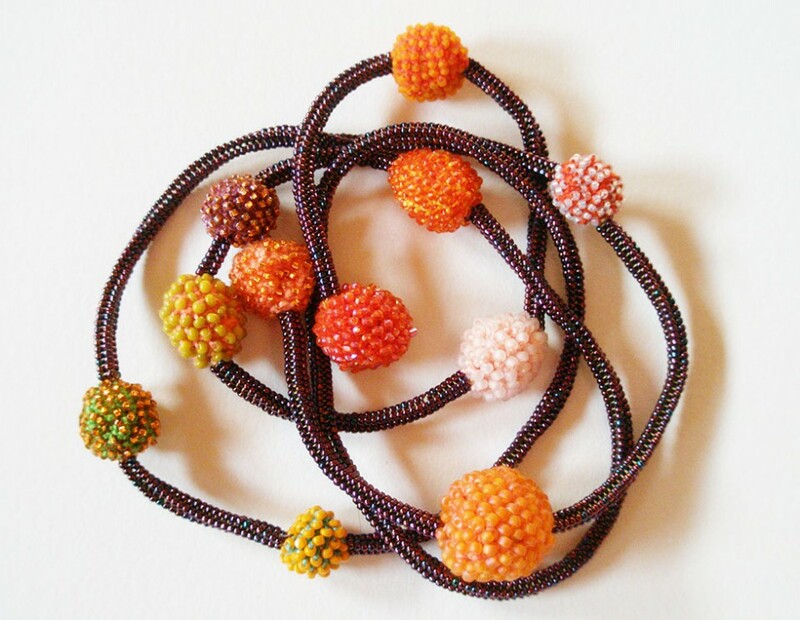 Glass seed beads, merino wool, crocheted. 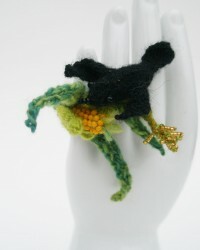 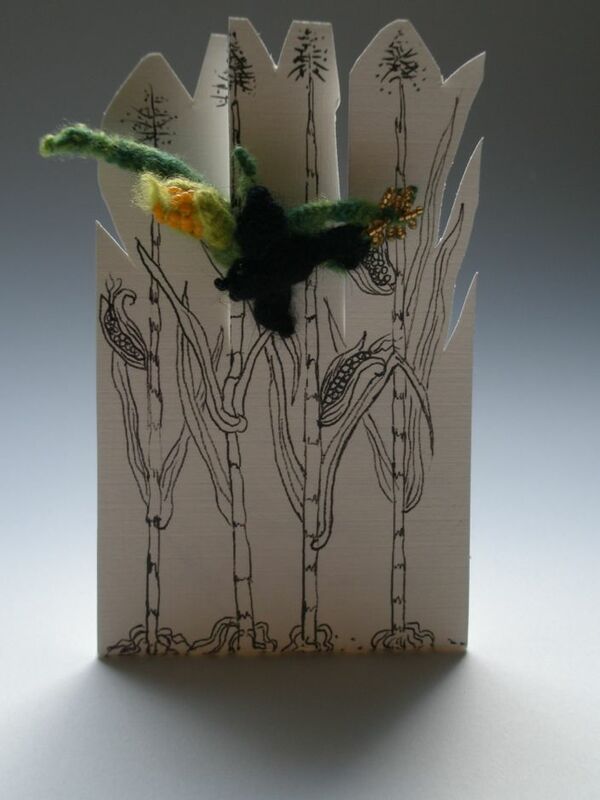 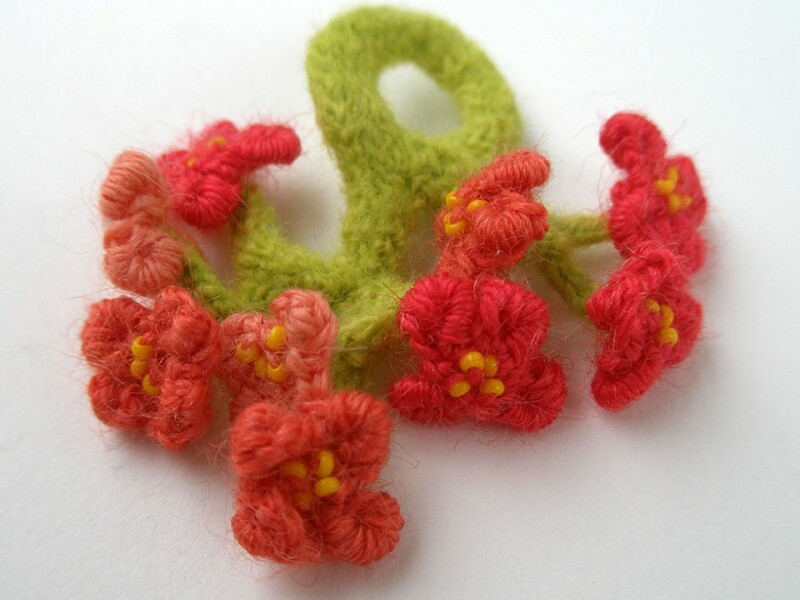 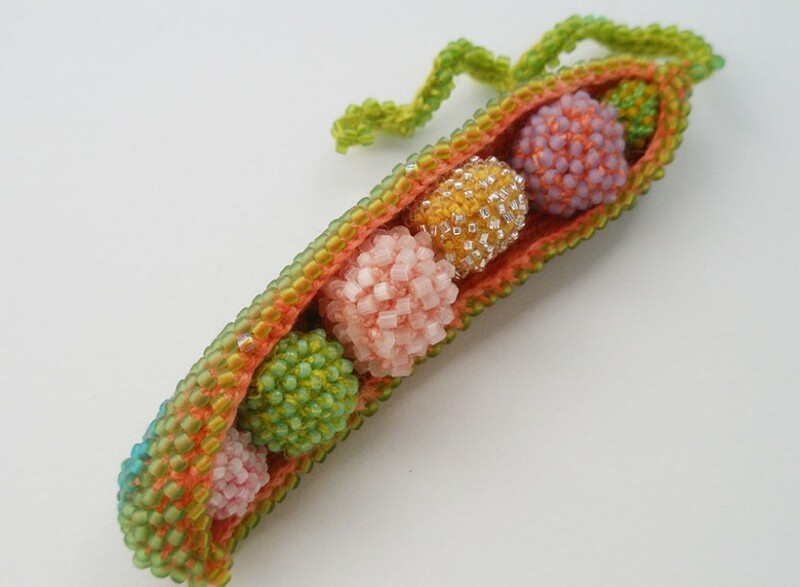 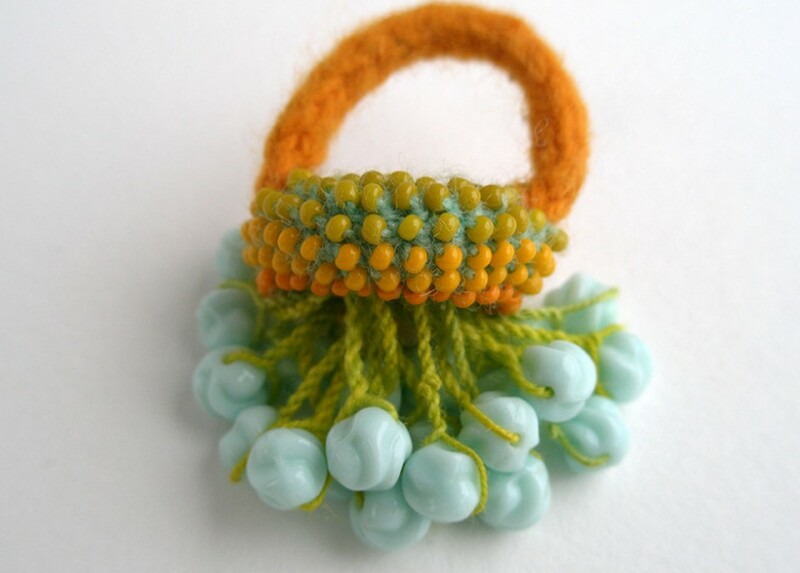 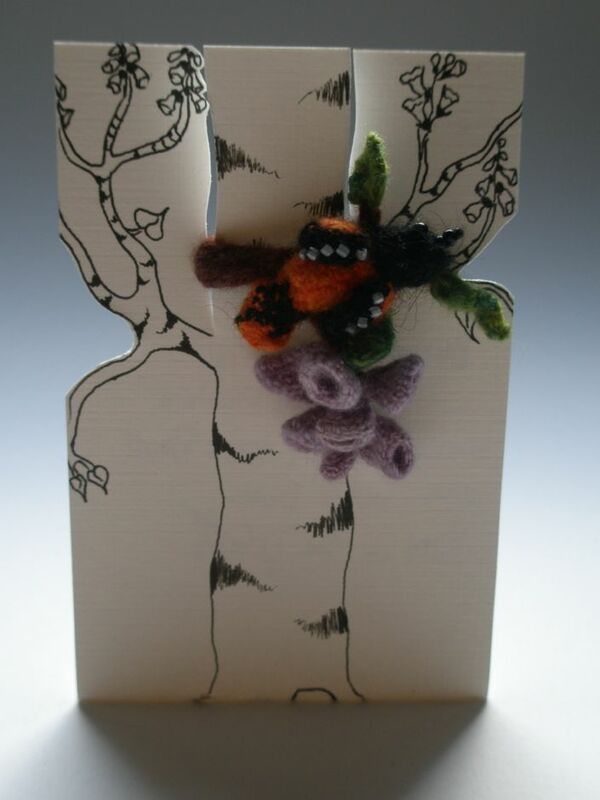 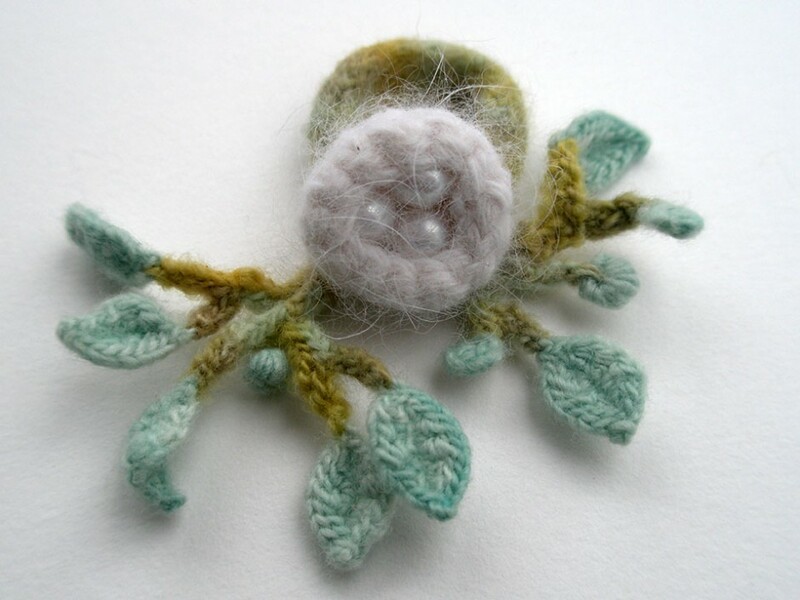 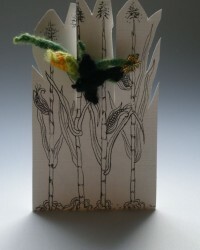 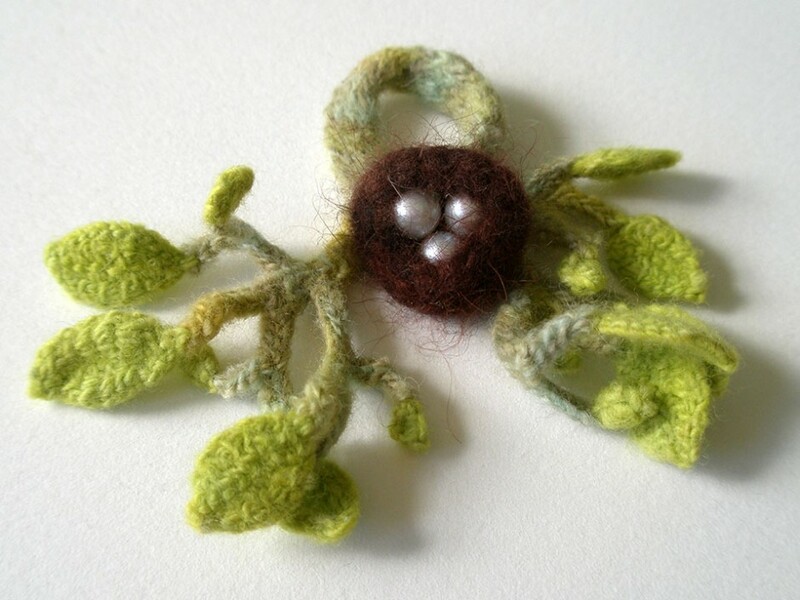 Pea Pod Brooch. 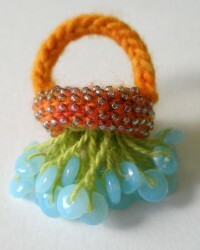 Glass seed beads, linen, cotton, crocheted, sterling silver pin back. 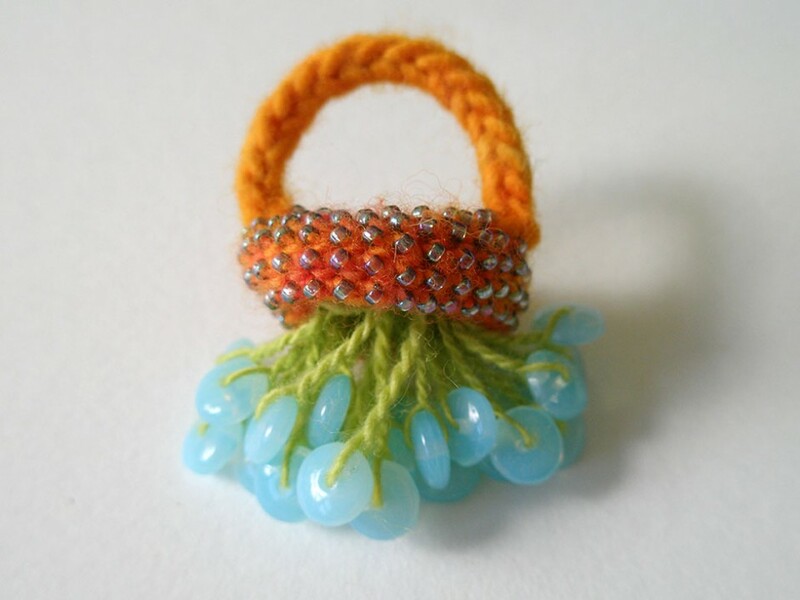 AnnaMona, ring. 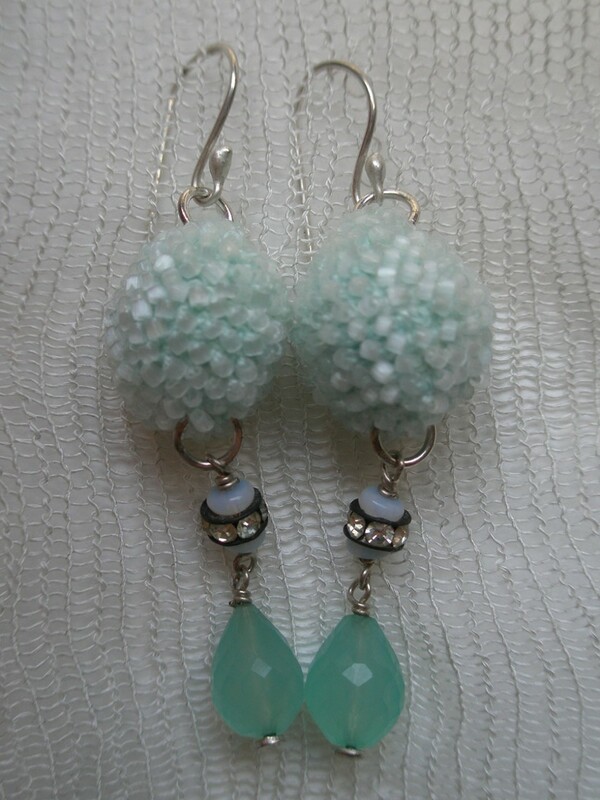 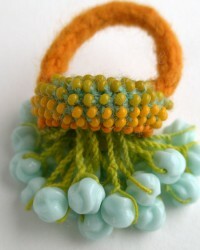 Glass beads, merino wool, crocheted and knitted. 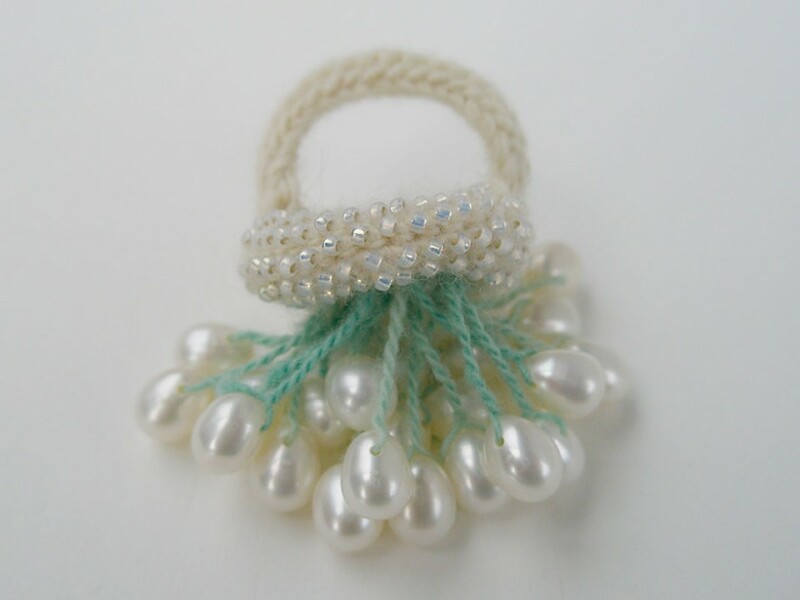 AnnaMona Ring. 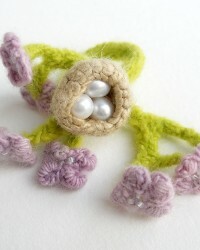 Pearls, glass beads, merino wool, crocheted and knitted. 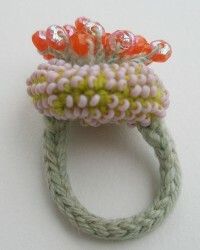 AnnaMona Ring. Glass beads, merino wool, crocheted and knitted. 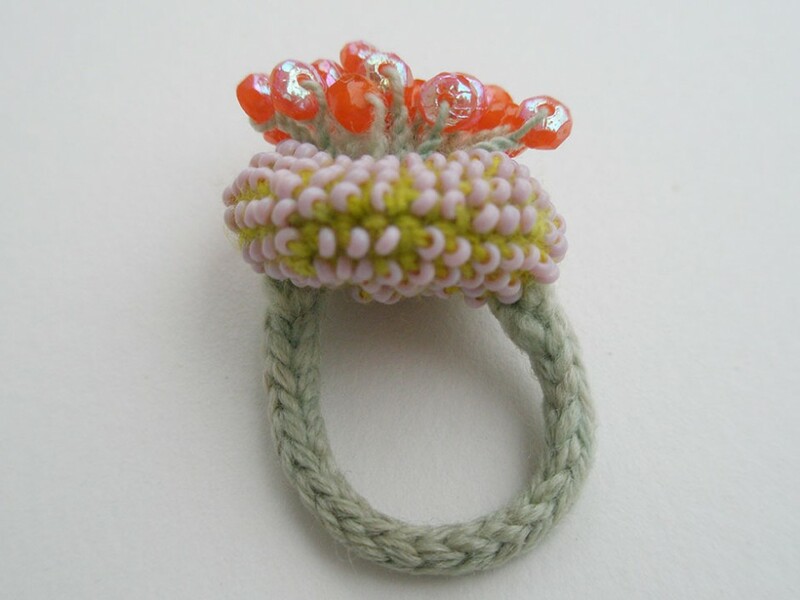 AnnaMona Ring. 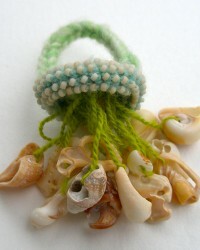 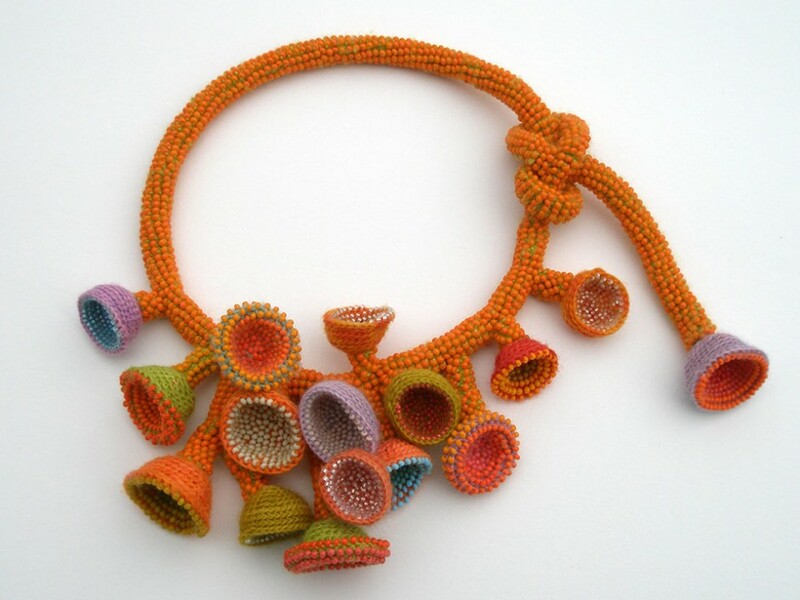 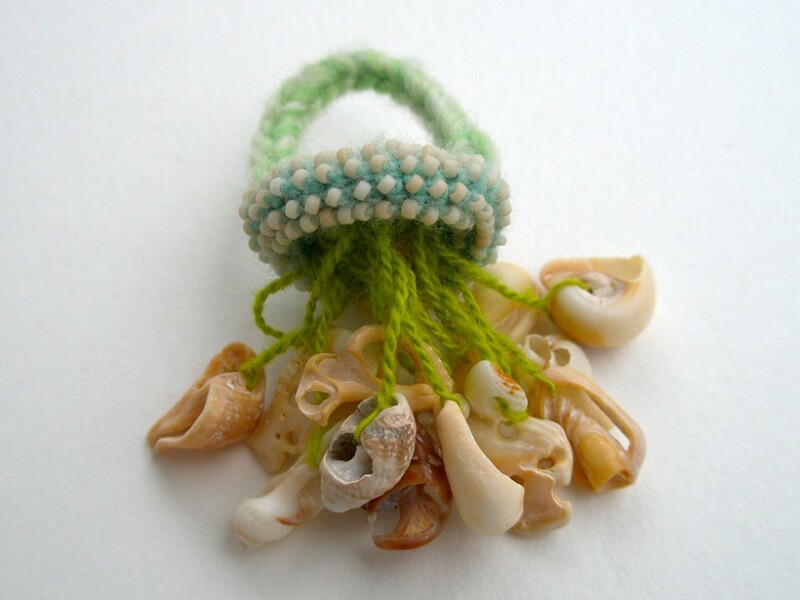 Shells, glass beads, merino wool, crocheted and knitted. 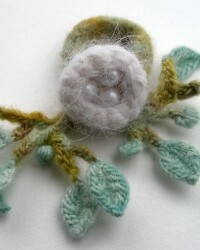 Dark Nest, ring. 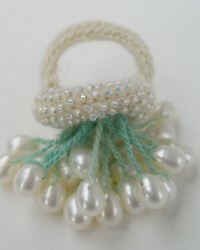 Pearls, hand-dyed angora, merino wool, crocheted and knitted. 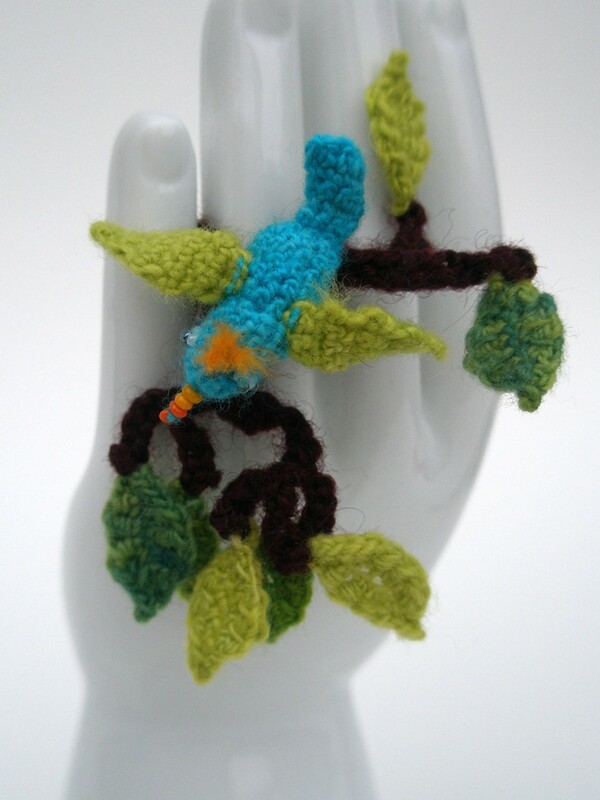 Nest, ring. 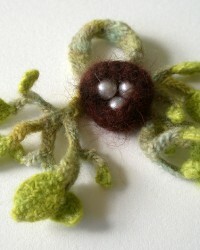 Pearls, merino wool, angora, crocheted and knitted. 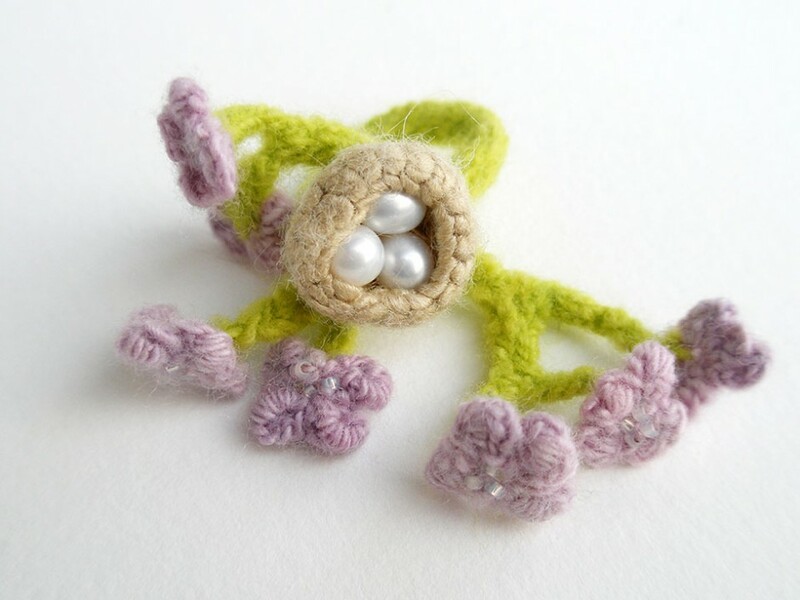 Cherry Blossoms, ring. Glass seed beads, Crocheted and knitted wool. 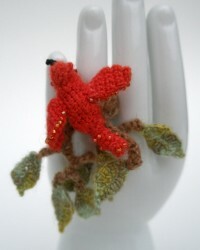 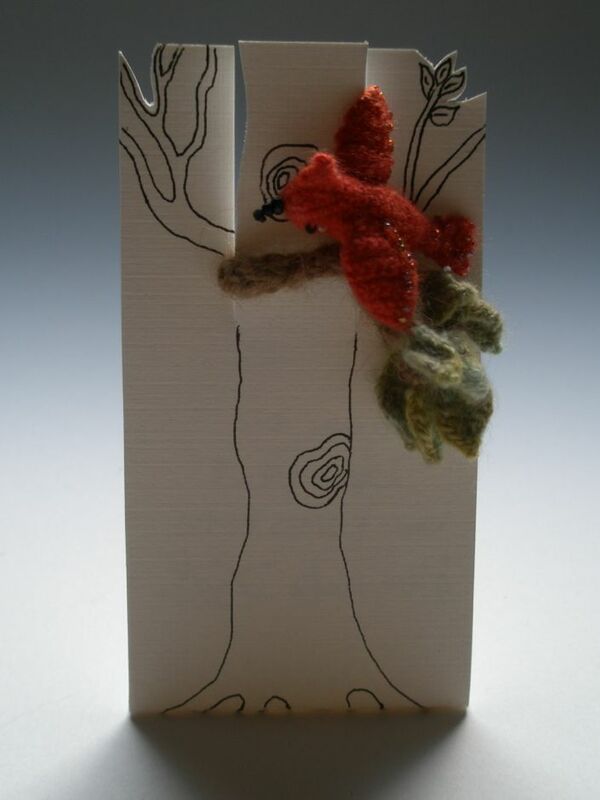 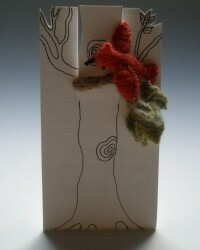 Red bird in branches, ring. 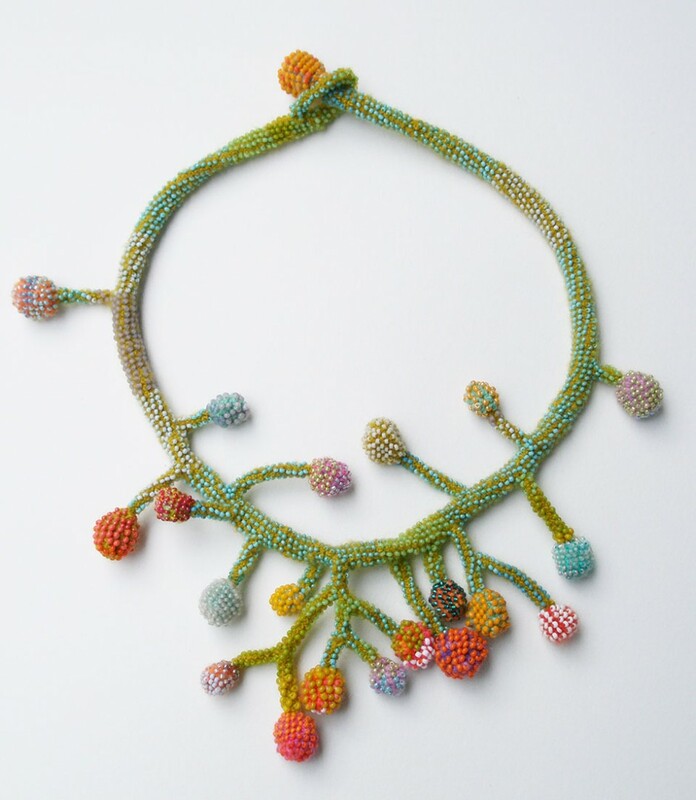 Glass seed beads, crocheted and knitted merino wool. Blue bird in branches, ring. 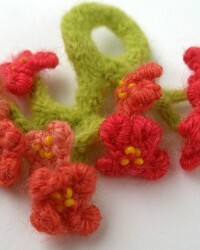 Crocheted and knitted merino wool. 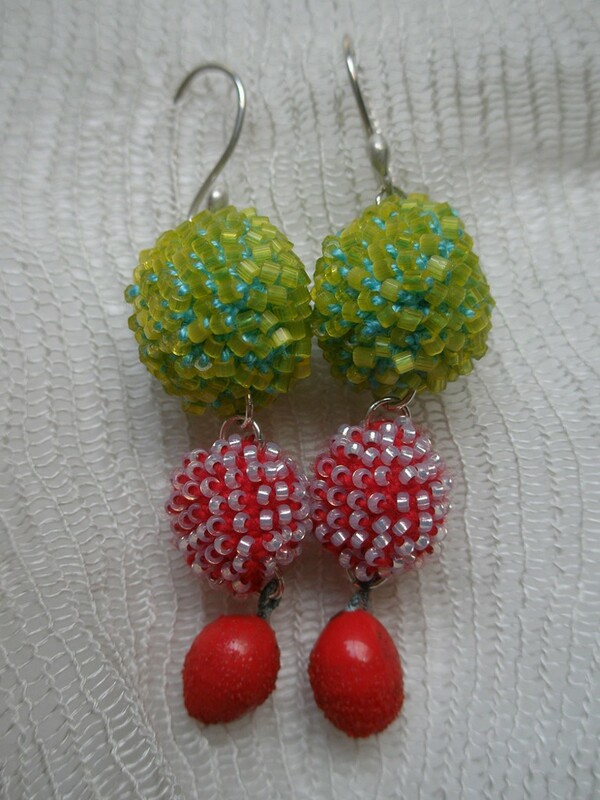 Glass seed beads. 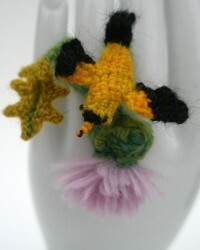 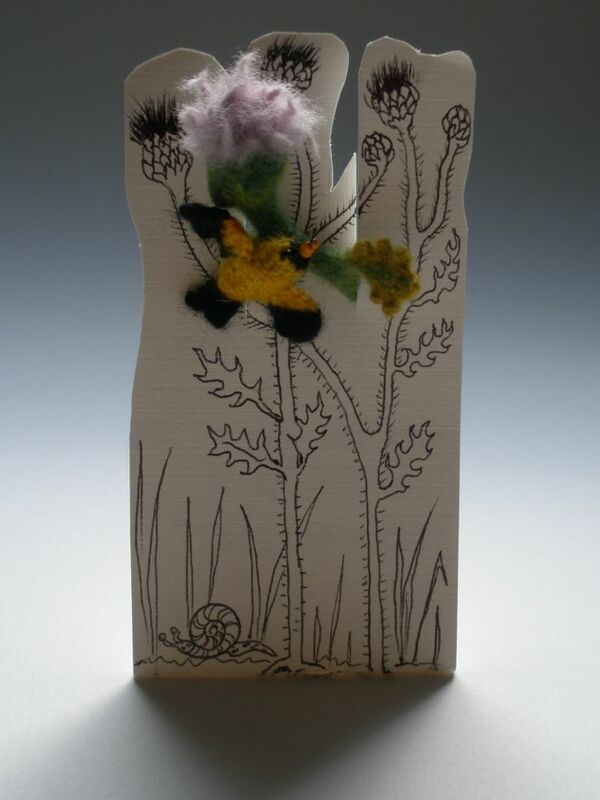 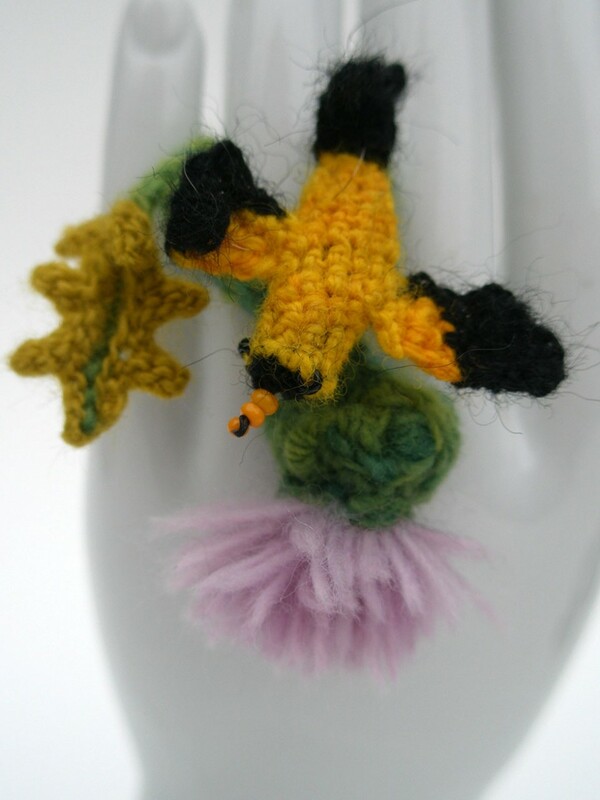 Goldfinch on Thistle ring. 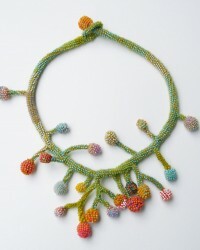 Glass seed beads, merino wool, crocheted and knitted. 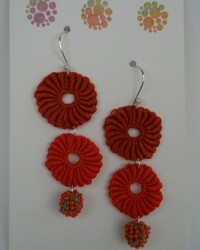 All original designs.